The most powerful thing a parent can do for their child is to pray. Sometimes, the only thing a parent can do for their child is pray for them, but that is enough. When your child is at school or camp, with another parent, or even grown and living on their own, these prayers for blessings, protections, wisdom and insight will resonate with you. Written from the heart of a mother who has prayed her sons through schools, college, military deployment and now the distance that comes when they are grown and on their own, these words bring to life the concerns every parent has for their son or daughter. Whatever their age, if they are away for days or years, these prayers will speak right to the heart of God. What a wonderful and powerful book of prayer! As the mother of adult sons, this book is so perfect for me! It gives me the guidance of how and what to pray for my adult children. 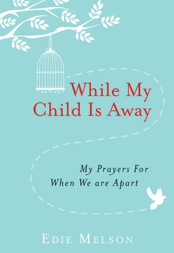 I have never seen a book like this before and it is so perfect for the mom (or parent, really) whose child is away from them for whatever reason. If they are away at school or grown up and on their own, this book guides you through prayers that will protect them and help them. There are nine sections to the book, each on a topic that include faith, self-confidence, and good choices. I really found this helpful as I was able to find a prayer on the topic that fit the circumstance that I wanted to pray over. Edie also shares from her own life and she is so open in sharing things that you feel like she's a dear friend. You find that the things that concern you, she has dealt with and she directs us to pray first, which is such a great reminder for those of us to don't do this! I have little flags on the prayers that I want to refer to for my children every day and highlighting throughout. You can either pray the prayers that she has in there, word for word, or you can allow them to guide you in your own prayer. I really loved this because there are things that she so eloquently says that really get to the root of the matter. It helps me so much to have this guidance for my prayers! She also shares prayers in areas that I had never really thought about but that are so important for our children! I love this, too, as it has given my prayers more depth and width. I highly recommend this book to any parent who prays for their children. These prayers will make your prayers more on point and give you direction on what to pray. I really love this book and it has been added to my quiet time area to direct my prayers for my children. I give it 5 out of 5 stars.